Toop&Toop Blog: Tired of missing out on property? What if you could gain access to inside information...? Tired of missing out on property? What if you could gain access to inside information...? As Suzannah mentioned last week, the property market is taking off. With the housing market the most affordable it has been in a decade, Australians are flocking to property! With so many people entering the market, competition for property is rife and securing your dream home can take longer than you first thought. This is especially the case in the first homeowner bracket, as investors are flooding back into the market, taking advantage of these great conditions. I have a number of frustrated friends who are ready to buy; they have their finance pre-approved but seem to just keep missing out on properties. I can understand their concern, as I too was in a similar position back in December last year when I was purchasing my last property. We went to countless auctions and put in a number of offers, before finally purchasing. It got me thinking; what if there was a way to speed up the process... what if there was a way for serious buyers to have an edge over the rest of the market? In today's day and age, information is expected to be instant. Google, news sites, social media—information is available everywhere, instantly... so why should real estate be any different? In the real estate industry it's common for properties to be kept "secret" before they are released publicly. This is not necessarily intentional; it's more about logistics. While a property is being prepared for sale, home styling, professional photography, video production and all other property marketing is being organised, it could potentially sit as a file on a desk somewhere for weeks or in some cases, even months. ToopVault is a secure place where our clients' properties are kept while they are being prepared for public release. 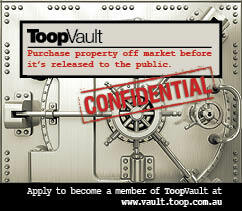 Members of ToopVault are serious buyers who have agreed to some key conditions, and have all been approved by us. ToopVault allows our clients to attract buyers to their property from day 1 (our Sales Partners can load the property into ToopVault live before they even leave your property). ToopVault also means that serious buyers—like my friends—can apply and have access to information before anyone else. They can view and even purchase property before it hits the market! This is a game changer, and a must for serious buyers. So if you're tired of missing out, or you just want to find your next home sooner, stay one step ahead and apply now for ToopVault membership at www.vault.toop.com.au.